“Take Charge! Student Energy Education and Action” engages high-school- and college-aged youth to reach out to their communities with information about energy efficiency, renewable energy, and green jobs. In just two years, Groundwork Denver’s Student Energy Ambassadors (SEAs) conducted presentations and service-learning activities in over 40 Denver neighborhoods and 43 Colorado communities, connecting with some 36,000 residents to provide information and resources to reduce energy bills and greenhouse gas emissions. The statewide project was developed by Groundwork Denver in partnership with the Colorado Department of Labor and Employment, with funding from the American Recovery and Reinvestment Act. The predominant Take Charge! service activity is the Porch Bulb Project, in which SEAs go door-to-door offering to swap the front porch light bulb from an incandescent to an energy efficient bulb. The straightforward action of changing the porch light bulb on the spot opens the door to a more in-depth conversation about energy savings in the home. SEAs use the opportunity to inform residents about how they can reduce their energy use by changing habits, such as washing clothes in cold water, and by making home improvements, such as installing weatherstripping or insulation. Depending on the neighborhood, residents can sign up for recycling, free trees to plant, and home energy audits and receive information about other Groundwork programs, such as transportation resources, waterways projects, or walkability efforts. 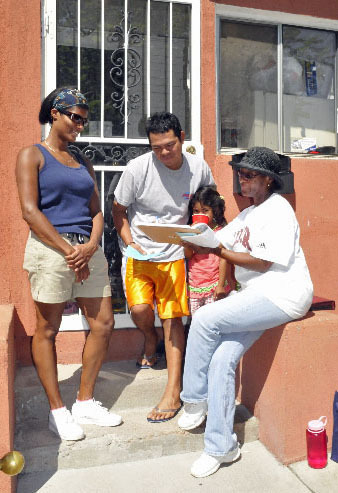 Groundwork Denver Porch Bulb Project canvassers review information with a resident of Denver’s Cole neighborhood. 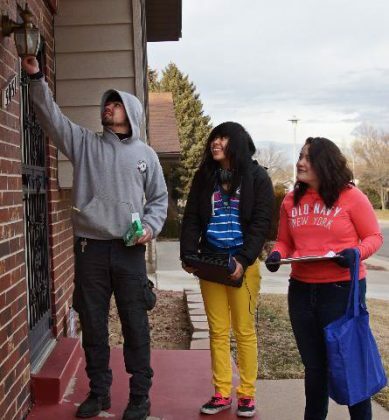 In addition to these measurable results, Groundwork Denver’s neighbor-to-neighbor, door-to-door approach is a successful strategy to reach out to Denver’s low-income and elderly residents, people who are often hard to reach through common communication modes.